The Oscar ceremony and the Chinese New Year both love the color red. As these 2 events collided this year, they inspired this Chaxi. 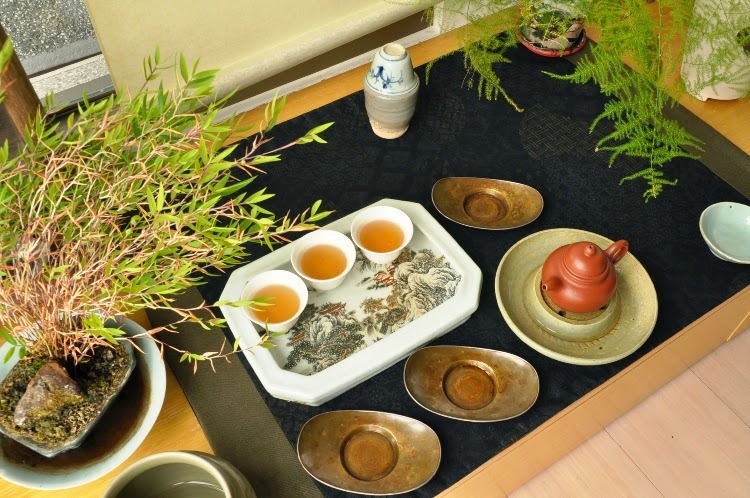 While the taste of tea can often be well explained with analogies to music, the brewing is a performance, an act. 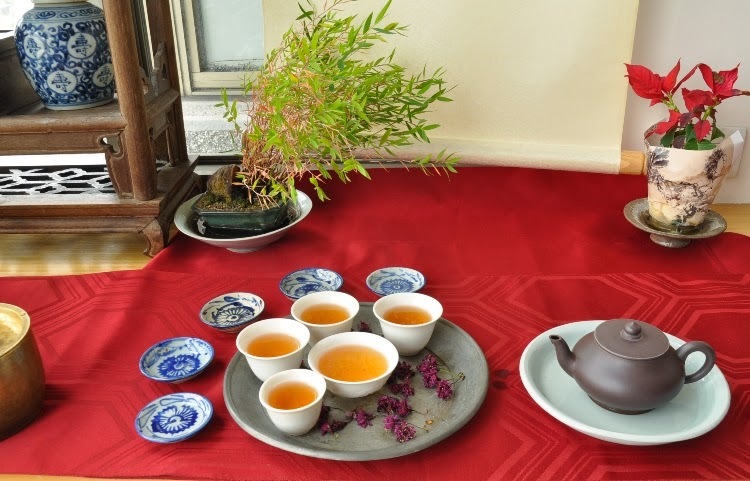 The tea is the lead actor and the brewer is the director (he also becomes an actor if guests are watching). Today, my main actor is a High Mountain Oolong from the CingJing area, harvested in spring 1990. It's one of the very first batch of high mountain Oolong! If you want great performance, select a great performer! It's true for movies and for tea. But even the best actor would be limited if he had to do all his acting on an empty stage. 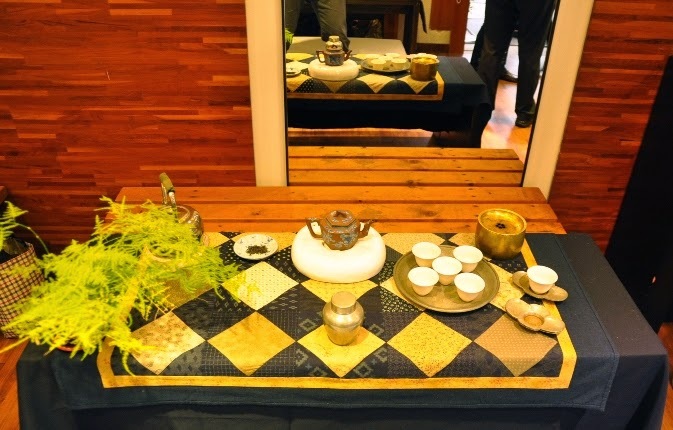 Here, a silky, red Japanese Obi (kimono belt) serves as background to my tea ceremony. Its shine and glitter feels elegant and beautiful like the red carpet or even fashion dresses worn by the stars. Clothes don't make the man, but they help the actor play his part. They transform his appearance to make the story feel real. 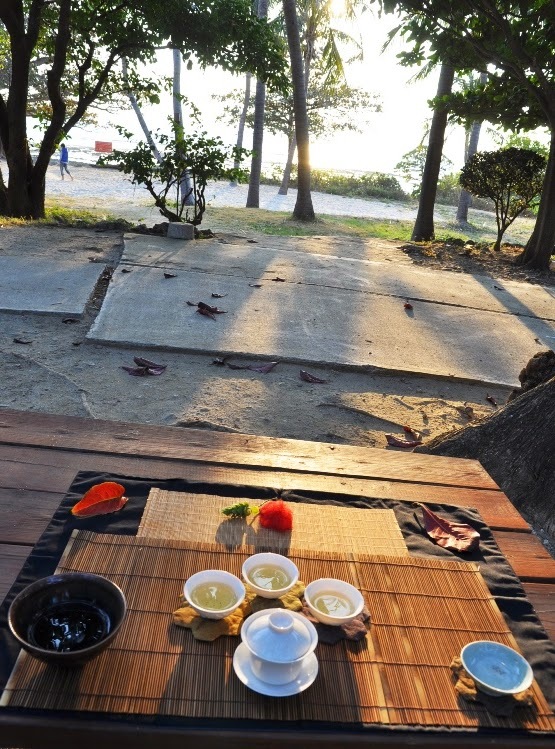 What is the tea's character will determine what teapot we choose to express accurately its original taste. 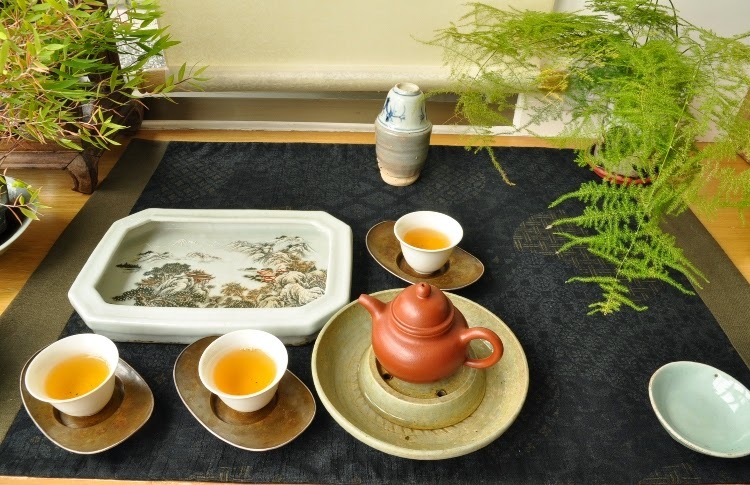 Tea is a story in several acts/brews. It would be boring if each brew would be a repetition of the last. Unless you use many leaves, it's unlikely that you get twice the same result anyway! What distinguishes the film director from the home movie maker is the ability to direct rather than just record. 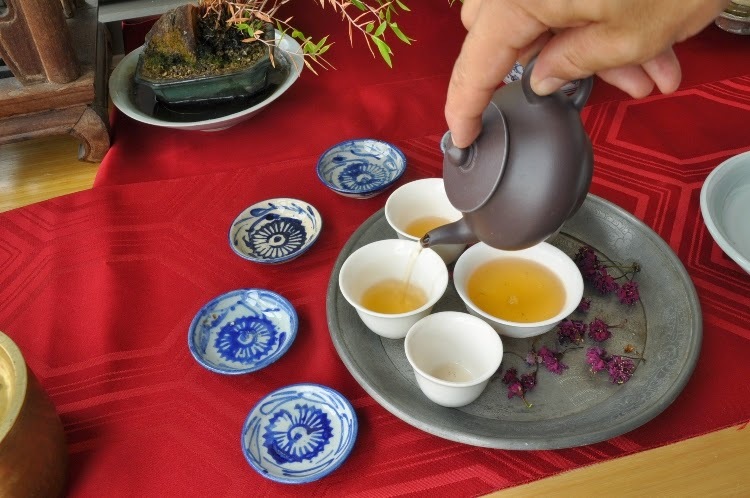 A beginner pours hot water and records what's happening to the tea. Whaoo! Each time is different! The director type brewer is not just recording, but he's brewing to make the best of his leaves at each stage of the brewing. He adapts the way he pours the hot water to the state of the leaves. He knows what taste he should achieve now with these leaves and tries his best to get it. The cup is like the screen on which you watch your movie. Is it Full HD or even already Ultra High definition? Are all the flavors well balanced and expressed? Or does it feel artificial and unnatural? Each cup alters the perception of the tea and it's always fun to play around with different cups. 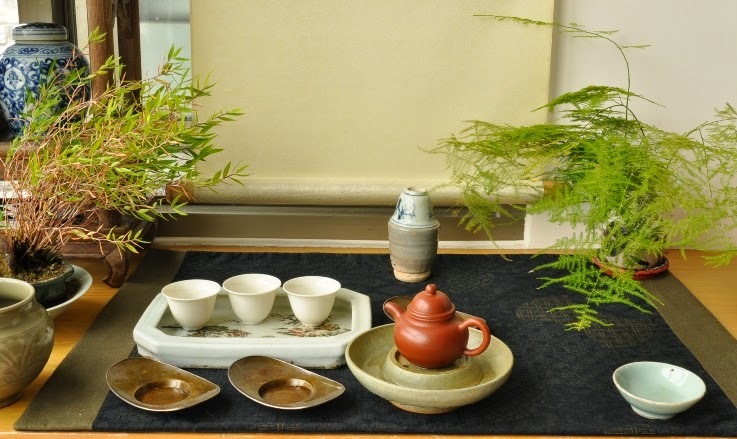 Here, I used very similar ivory-hued Dehua cups (and my flower cups). 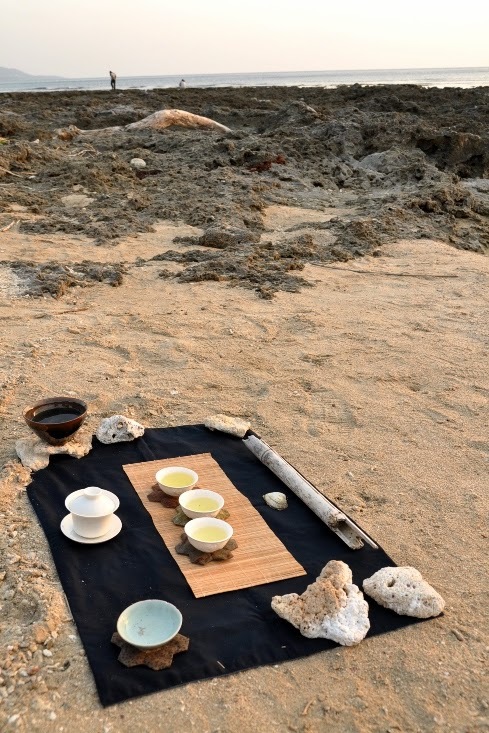 Unfold the red carpet for your best teas. Action! Young beauties and flowers will fade away, but there will always be great teas and stories to tell. 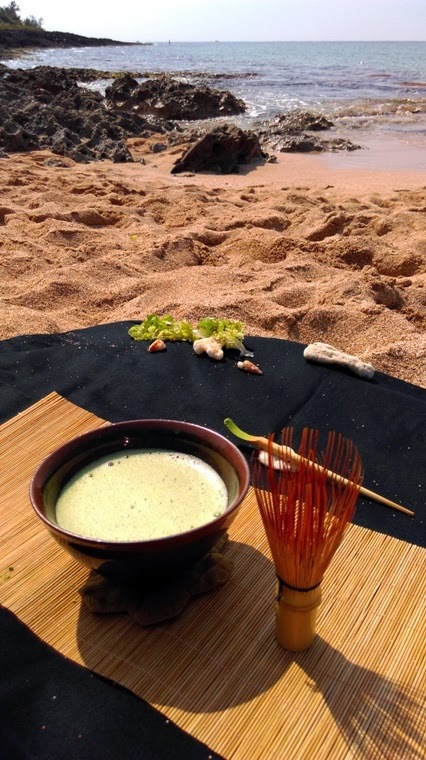 Ce ne fut pas la première fois que j'amenais un bol noir de Jianyang à la mer, mais ce fut mon premier thé vert en poudre fouetté à la plage. Ses arômes marins d'algues et d'iodes sont amplifiés dans ces circonstances. Le goût change beaucoup avec l'environnement et je remarque combien le thé vert s'adapte bien à la mer! 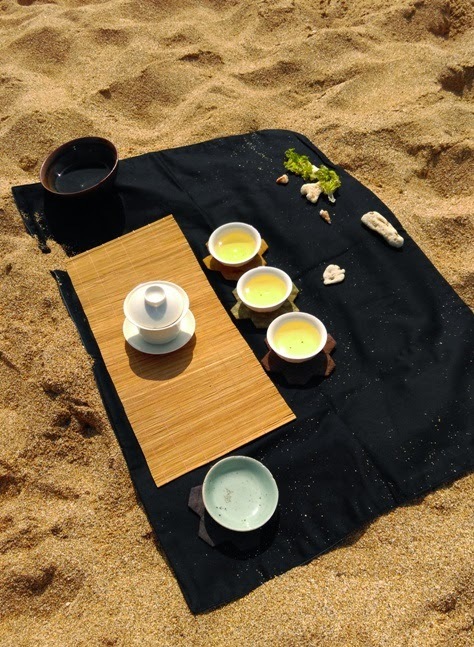 Mon Qingxin Oolong non torréfié de Shan Lin Xi du printemps 2014 m'apporte plus de fraicheur sous le soleil de midi et, lui aussi, semble devenir plus marin sur cette plage. 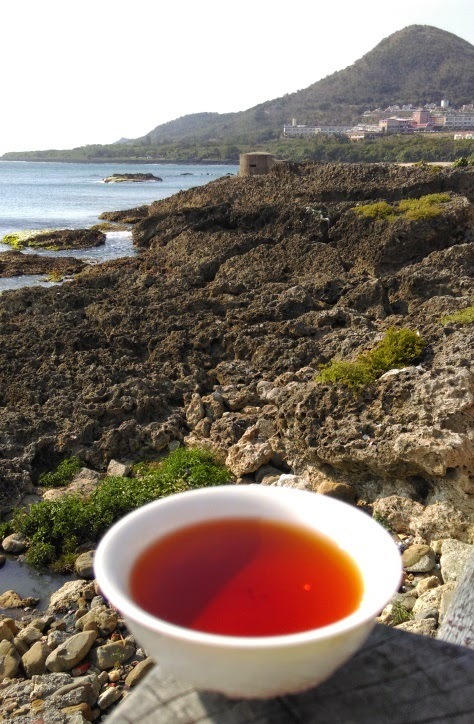 Le premier soir de notre petit séjour dans le sud de l'ile, j'optai pour un Hung Shui Oolong de Shan Lin Xi du printemps 2011. La lumière et l'ambiance relax du Oolong à la tombée de la nuit opèrent leur magie. 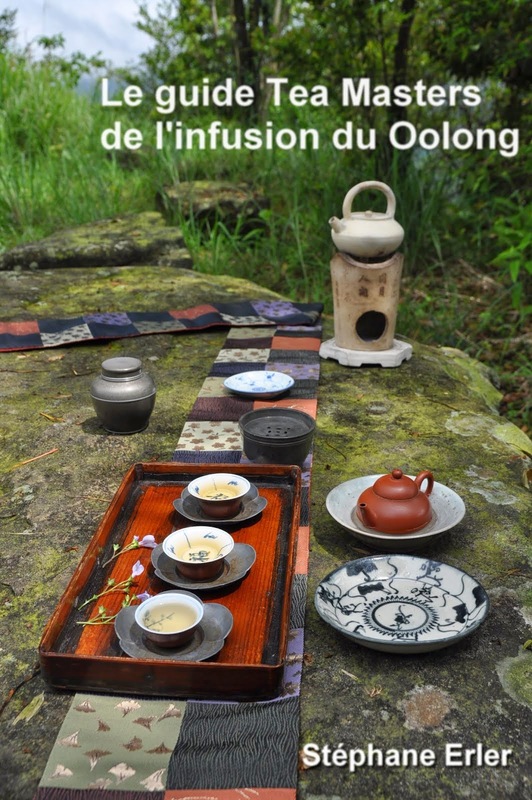 Je veux prolonger le plaisir et infuse un second thé: mon Oolong concubine de 2001. 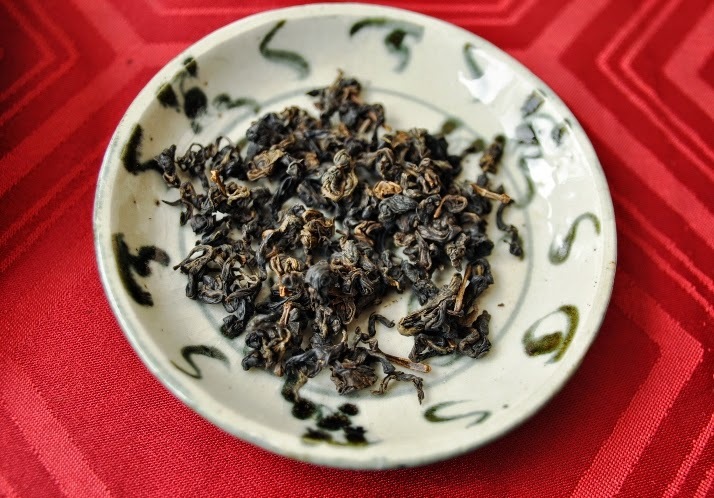 C'est le puerh de Menghai 7542 de 1999 qui m'a accompagné durant tous mes trajets en voiture. Pour cela, je l'infuse en thermos, afin qu'il reste chaud longtemps. Ainsi, j'ai toujours un peu de thé à portée de main pour me déslatérer et me tenir en éveil. Le truc pour utiliser le thermos, c'est de choisir un thé qui supporte bien les longues infusions et de ne pas mettre trop de feuilles. Ce puerh convient vraiment très bien. Après avoir mangé un pain chinois à la vapeur fourré de viande relevée de poivre noir, j'ai été époustouflé par le goût du puerh. Ses saveurs devinrent intenses et purifiantes pour mon palais. 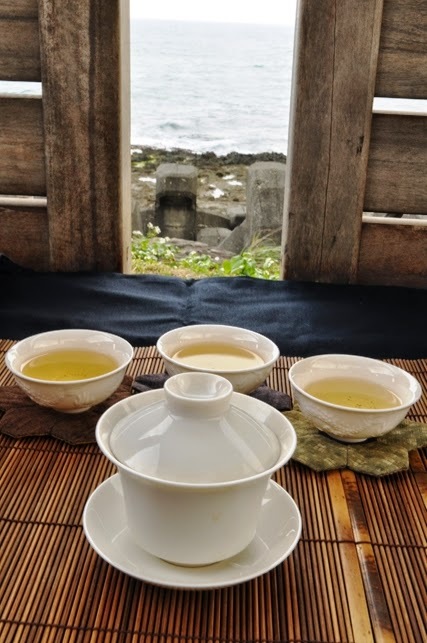 Lors d'une après-midi nuageuse et venteuse, j'ai infusé le Hung Shui Oolong de Shan Lin Xi en face de l'Océan Pacifique, non loin de la plus grande dune de sable de Taiwan (à Gangzhi). 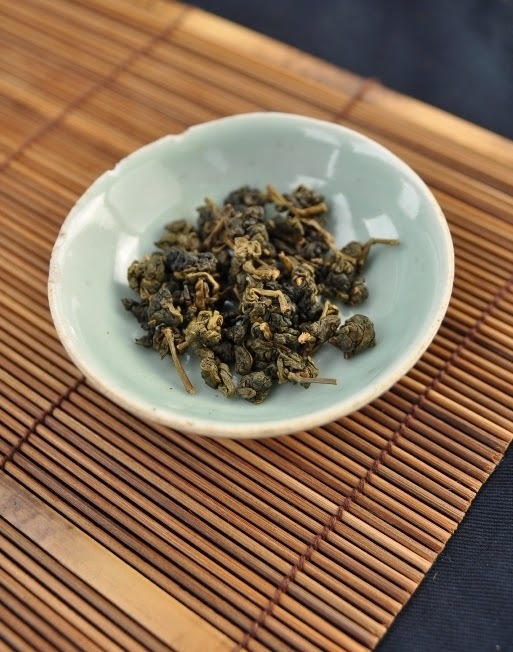 Ce Hung Shui Oolong a beaucoup de douceur et de finesse. Il demande un peu d'attention avant de donner le meilleur de lui. Les vacances aussi demandent un peu d'effort. Réaliser ces Chaxi là où je vais deviens de plus en plus simple avec l'expérience. Cela aide aussi de bien connaitre les thés qu'on amène avec soi, car ils vont avoir un ressenti différent de quand on les fait chez soi. Prendre conscience de ces différences est bon exercice pour progresser dans la maitrise du thé. J'arrive maintenant à ma dernière soirée sur la plage. Cette fois, c'est mon Wenshan Baozhong d'une plantation de 4 ans que je choisis. Il a de belles feuilles bien grandes et épaisses. Son caractère est bien préservé, car je ressens son goût herbacé sur cette plage! Il a aussi des saveurs de bois frais qui peuvent faire penser à la natte de bambou. 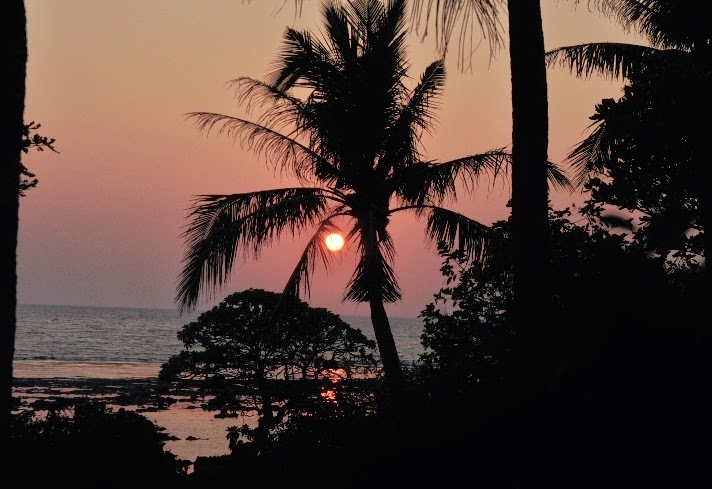 Et il apporte plein de douceur lors de la contemplation de ce magnifique coucher de soleil! 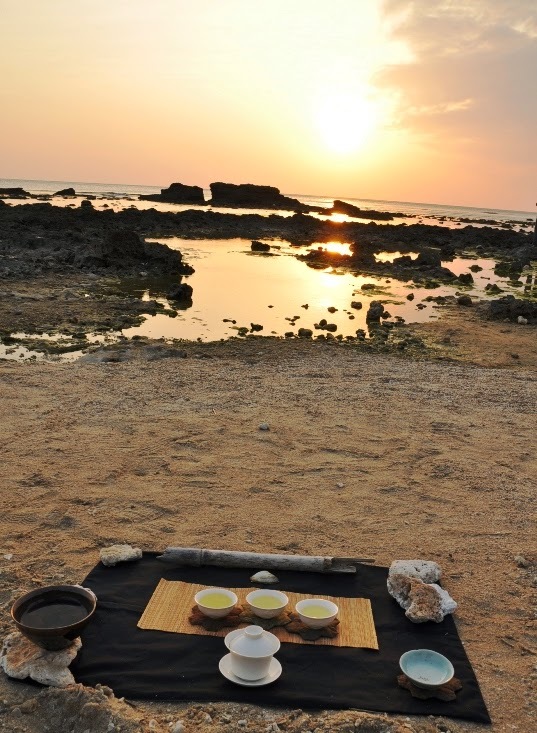 Quel bonheur de combiner les thés que j'aime avec le bonheur simple d'un séjour à la mer! 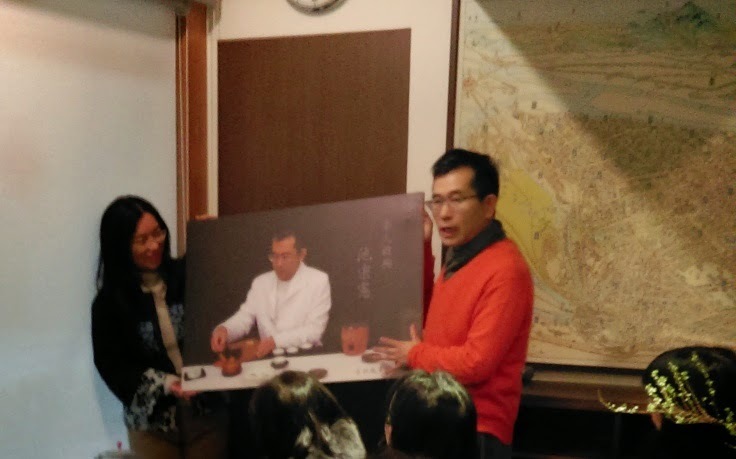 For this special event marking the end of K. C. Chen's era at the head of the Taipei Story House, Teaparker received this picture of himself performing Chaozhou gongfu cha. 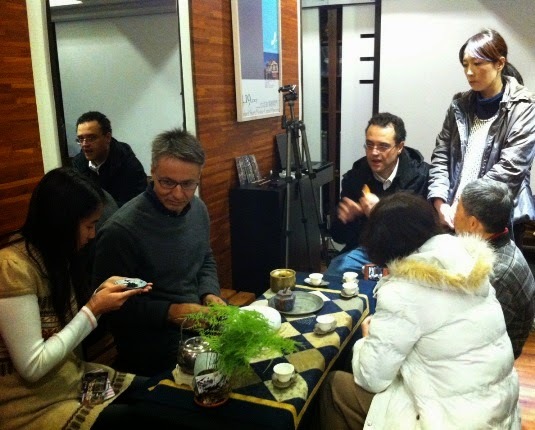 It was taken at the Taipei Story House in 2010 when a TV crew shot the documentary Global Drinks, tea (for France 5 TV). 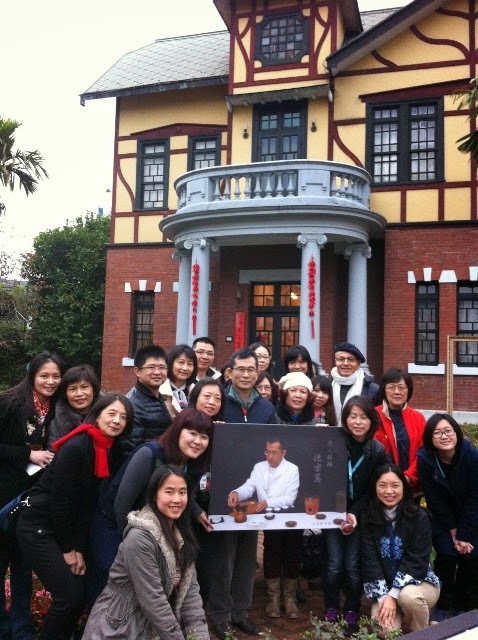 The Taipei Story House was built in 1913 for Chen ZhaoJun, a Taipei tea merchant, as a place to rest and entertain his guests. On Sunday, Teaparker invited us to a trip back in time and gave us 5 teas from the 1920s to brew! 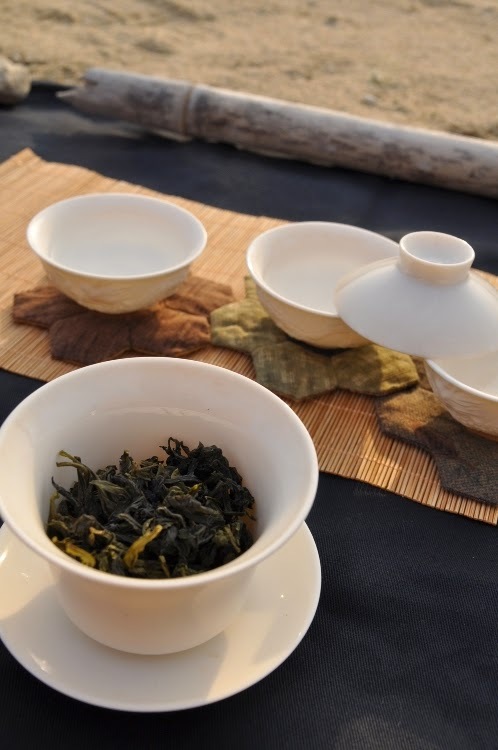 Evon started with a Fanzhuang Oolong, meaning it's an Oolong that was sold by a foreign tea merchant in Taipei. While the leaves were provided by Teaparker, all the equipment is her own. She's using a wonderful black obi (kimono belt) as chabu and a cultural revolution big bamboo teapot. 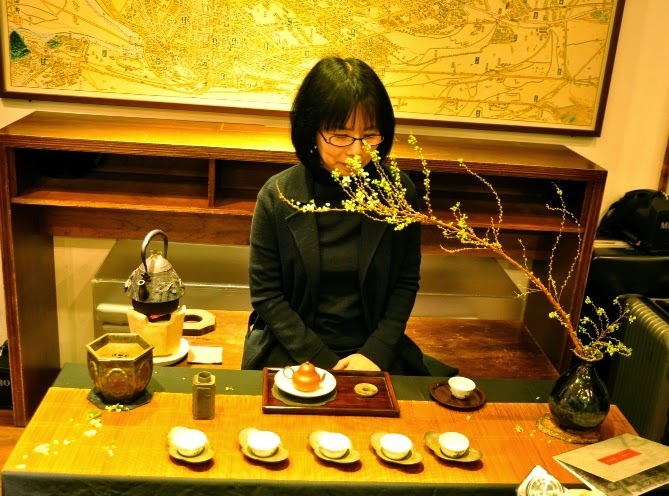 Most beautiful are her replica of Yuan dynasty qinghua cups with elevated Chatuo! 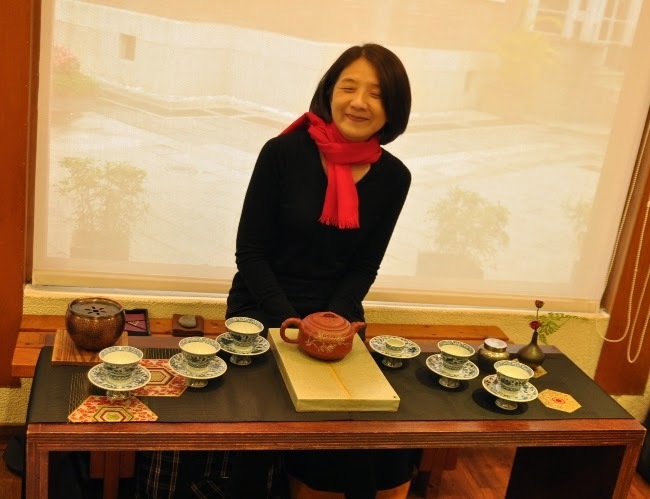 Next, Ms. Wu brews old Wuyi Yancha in her small Yixing zhuni teapot. 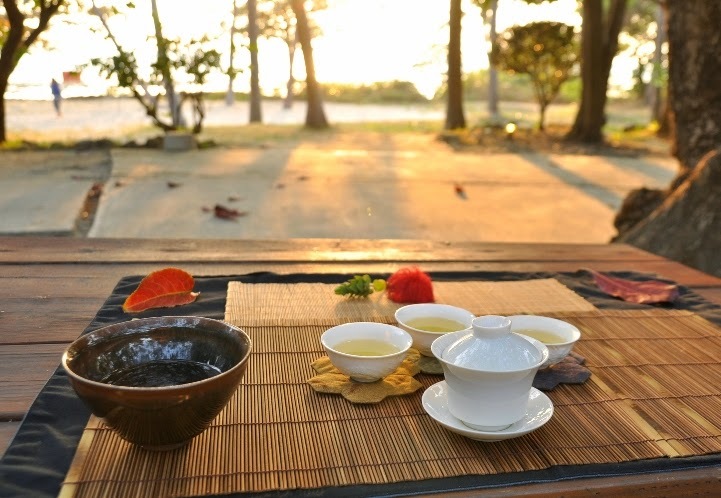 Wuyi Yancha is the place of origin of Oolong and also one of the most difficult to master. Beauty on a Chaxi can look so simple and easy, but it requires practice and a creative mind. 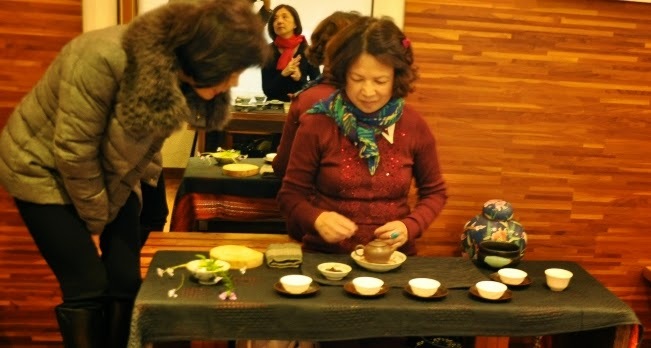 This event with 5 Chaxi is also an opportunity to see that we're not alone in preparing tea with style. 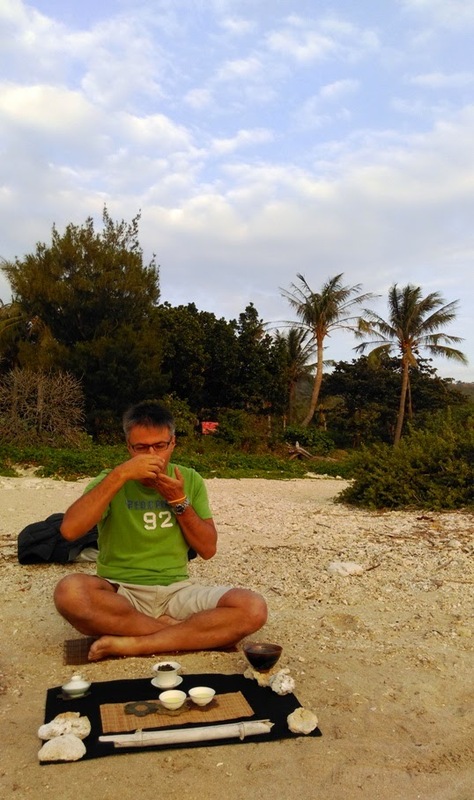 Every day we are using similar setups to enjoy our tea. 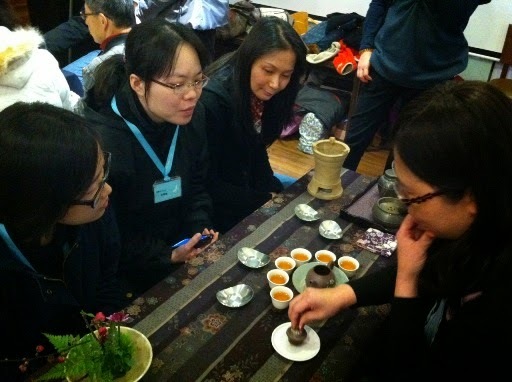 Here, Ms. Jian is going to brew a 1920s KeyiXing puerh. The brew's color was amazingly transparent and shiny! Then came my turn with the Chaxi I had parcticed of a day earlier. I brewed a 1920s Sun Yishun Liu-An GuaPian. The leaves are tiny and it's a tea that used to be exported to South Asia. 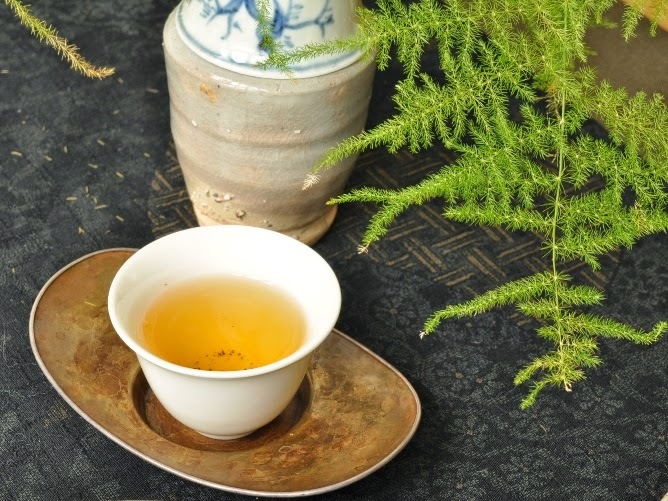 This Yellow Mountain tea (Anhui Province) used to be slightly oxidized. Its scent in the pewter tea caddy is splendid and powerful. It's intoxicating like old liquor or top grade incense! Teaparker recommended I only use few leaves, a slow pour and long brew. The result was surprisingly thick, clean and sweet. 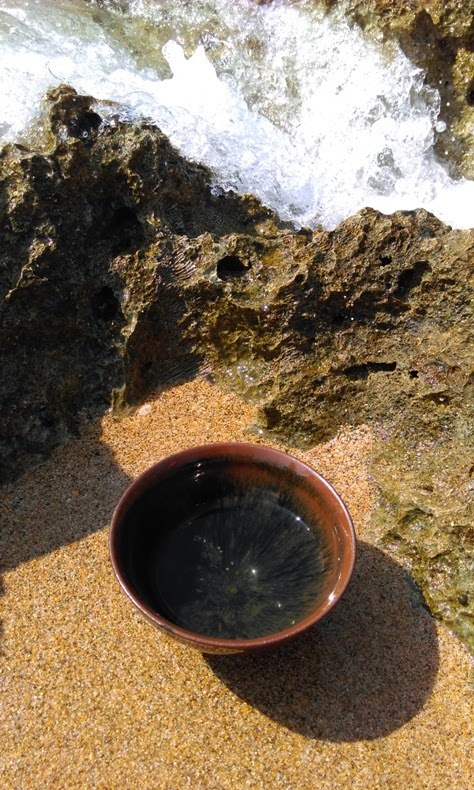 The aftertaste of a small cup lasted a very long time, with waves of warmth in the body. I was particularly glad that I could share this special moment with Emily, a Penn State alumna and reader Miguel with his family! 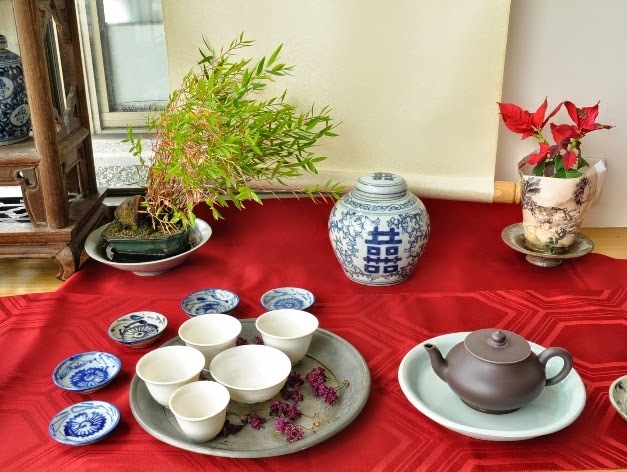 Old tea and wares are passed from one generation to the next. It's nice to see how tea brings the family together and how a simple moment of happiness can be shared and passed to the next generation. Above and on the left, Ms. Chen prepared a Baozhong that was sold by Chen ZhaoJun's company in the 1920s! 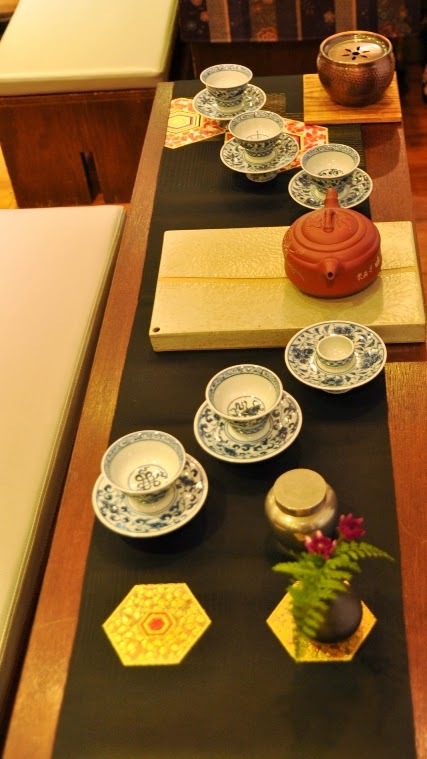 It was interesting to see that Baozhong tea used to be rather flat and small back then. 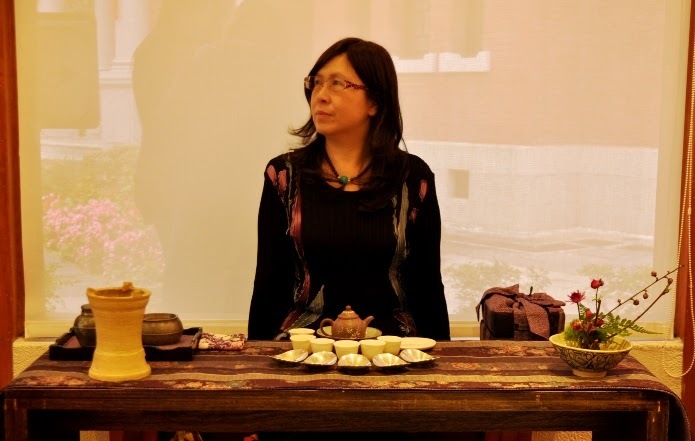 She also made a beautiful purple color Chabu matching the colors of her early RoC Yixing teapot for this occasion. 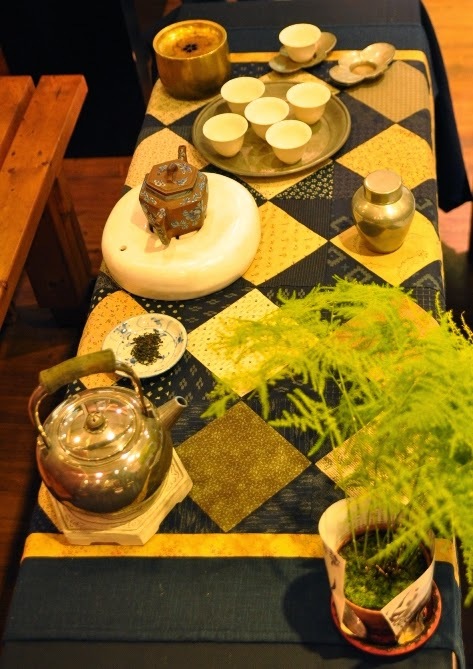 All these tea still felt alive and brought lots of joy and astonishment to all the participants. It showed just how resilient top quality teas can be. 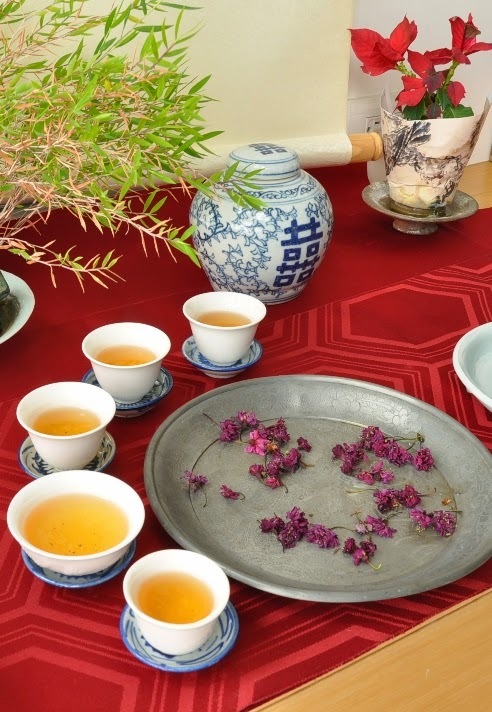 It's not a quest for the oldest tea, but for exceptional flavors. And this Sunday, we were blown away! It was the highest concentration of great teas and Chaxis I have seen on a single afternoon. 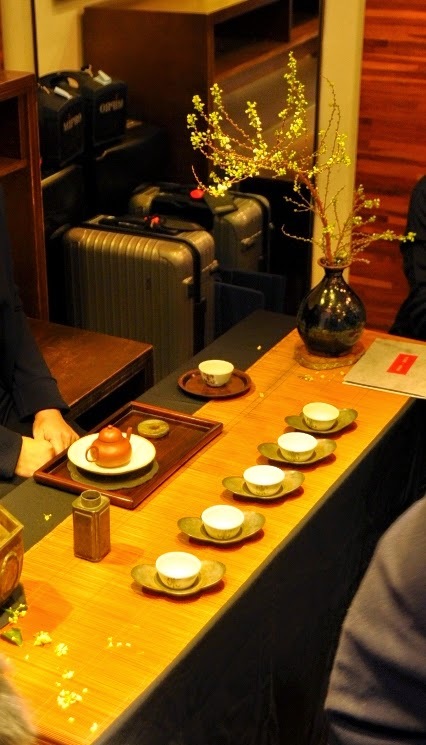 May the Taipei Story House continue to connect tea lovers with Taiwan's rich tea culture! 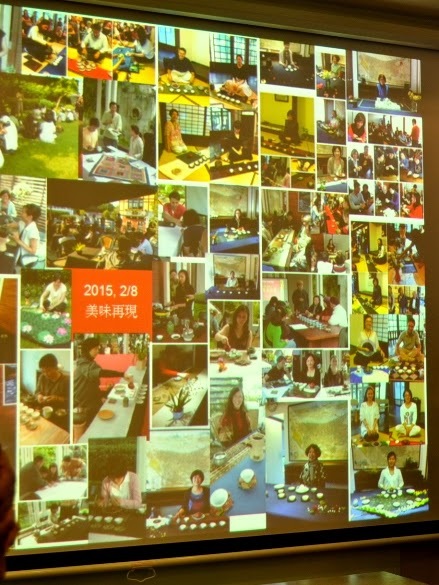 It will take place this Sunday, February 8th, at 3 PM at the Taipei Story House (next to the Museum of Modern Art). 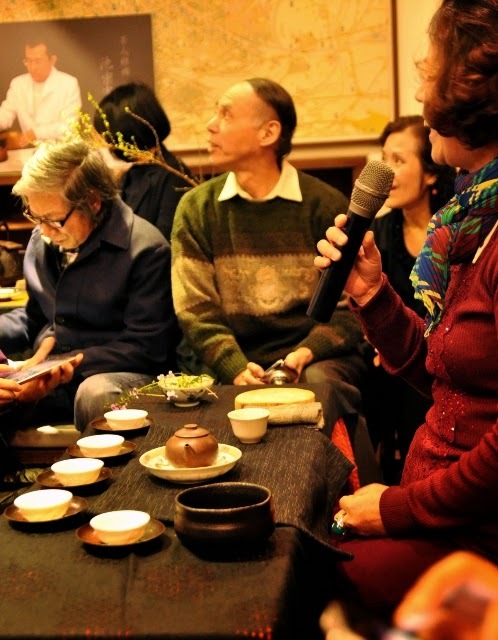 Teaparker's Cha Ren Ya Xin's association will perform several Cha Xi for a special event. I will also participate and hope to take beautiful pictures on this special occasion. Our Chaxi will honor the retirement of the current head of the Story House. 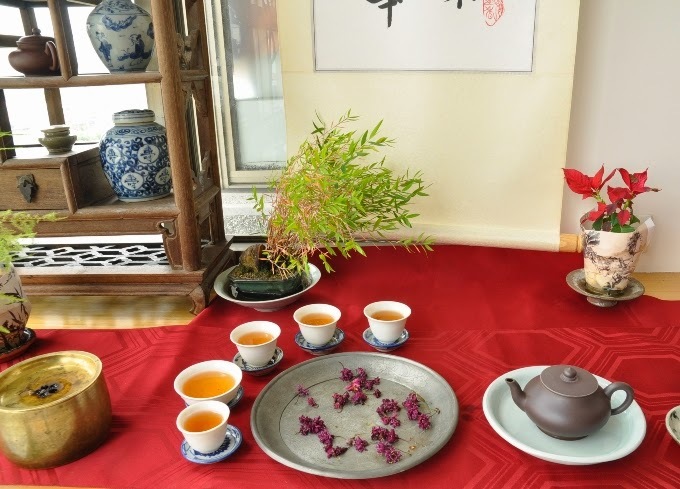 Ce dimanche, 8 février, à 15h, je serai au Tapei Story House avec l'association Cha Ren Ya Xin de Teaparker. Nous aurons plusieurs Chaxi pour célébrer la retraite de la directrice actuelle, K. C. Chen. En 12 ans, elle a su donner une dimension culturelle à cette demeure historique d'un marchand de thé du début du 20ème siècle. Nous lui dirons merci et montrerons que nous continuons de s'inspirer de sa démarche: puiser de l'énergie et de l'inspiration dans l'ancien pour créer du bonheur dans le présent! 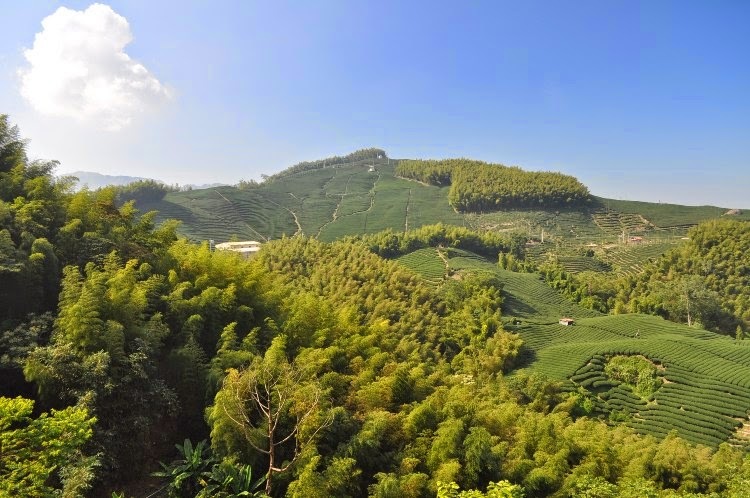 This is a typical view of tea plantations at Shan Lin Xi in Central Taiwan in spring. On the picture above there's a balance between plantations and mountains. But even though tea plantations are quite beautiful, sometimes their presence can look too intensive. 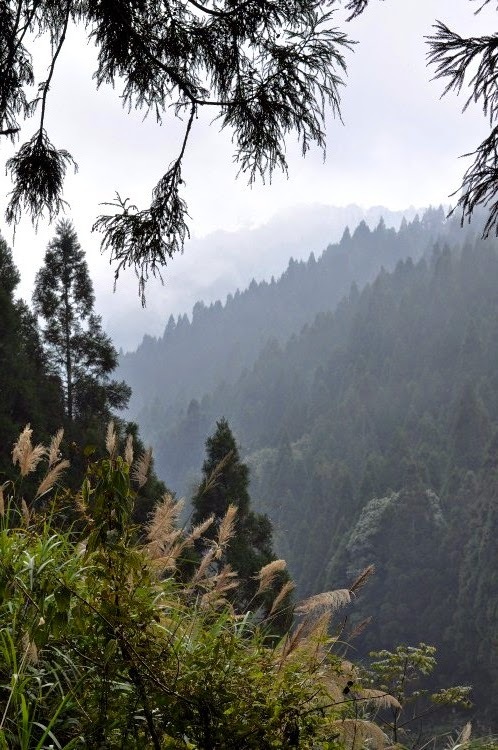 When all the vegetation that remains are tea bushes, it's more easy to forget the extraordinary fact that we are on a high mountain, at 1500 meters above sea level. 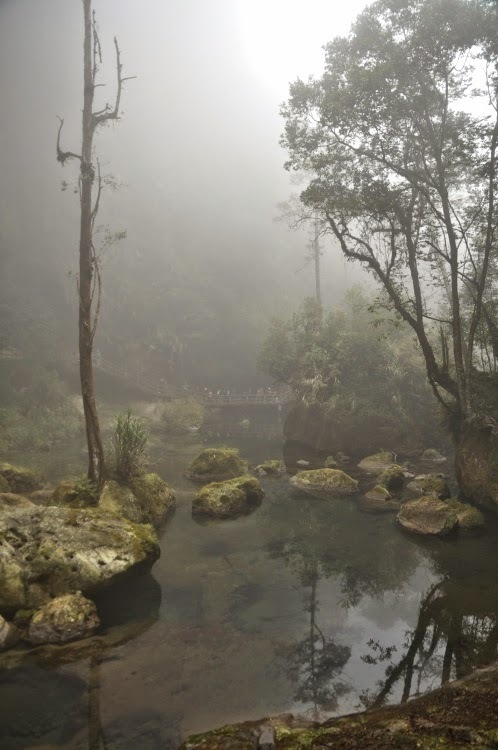 So, today I propose to show you some pictures from the Shan Lin Xi National Park, just a few kilometers away from the tea plantations. I took them a month ago, early January. This protected area doesn't look subtropical at all! 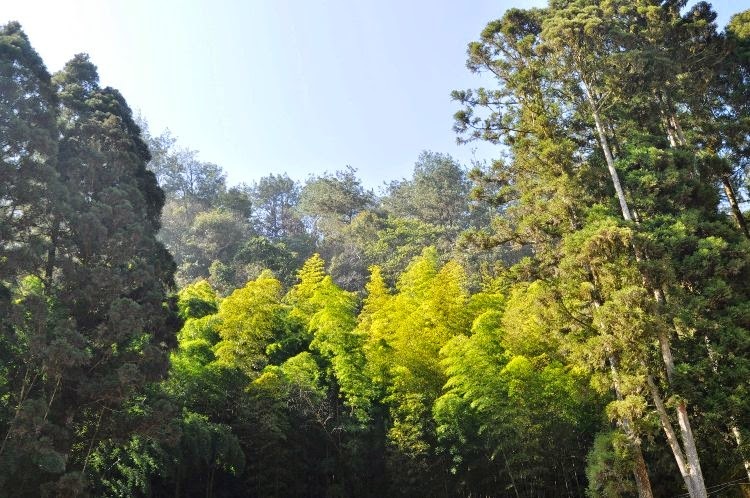 Tall pine trees dominate the bamboo. But it's not just the vegetation that changes. These pictures also show how quickly the morning sun is replaced with fog and clouds in the afternoon. The temperature drops quickly. Everything is big, dramatic and extreme at this elevation. The light coming through the fog looked bright, but everything else became dark and mysterious. 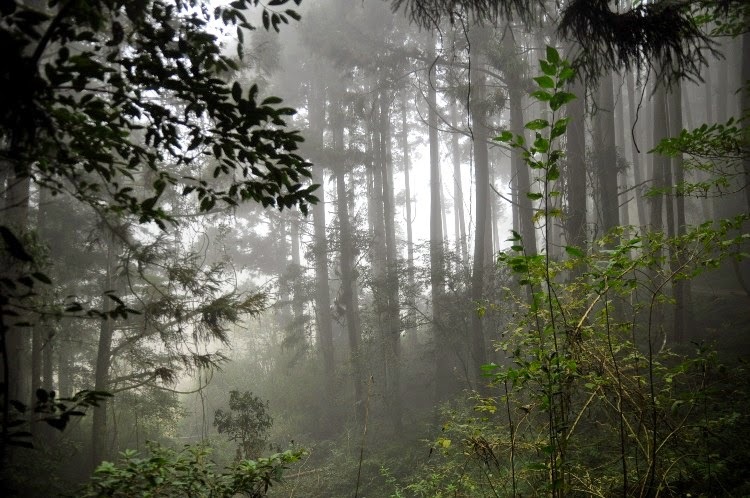 This fog brings moisture and freshness to all the plants, including our Oolong leaves. 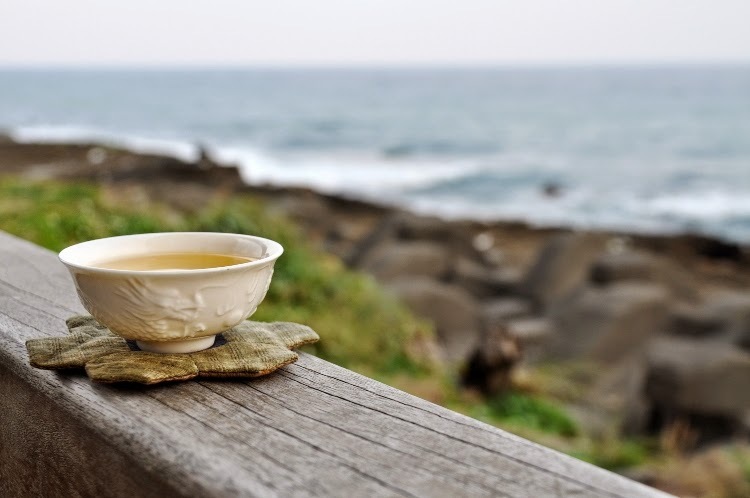 This afternoon fog is the secret ingredient of high mountain Oolong and explains why its leaves can grow so long while retaining their suppleness and freshness. 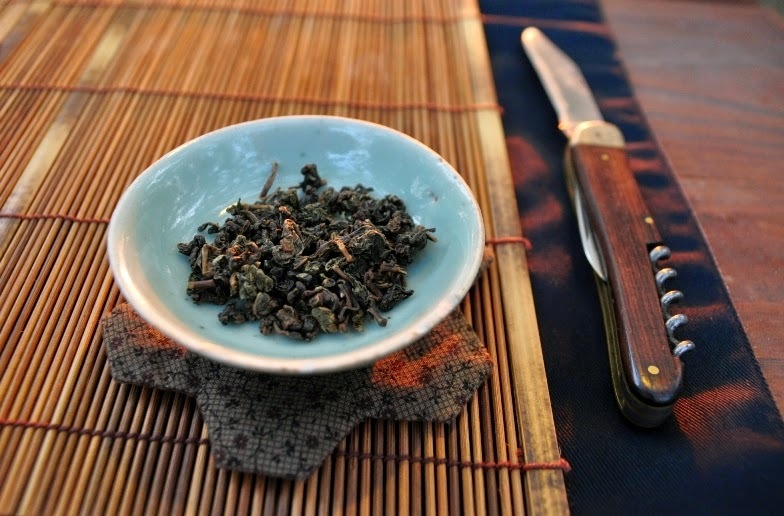 These dark green leaves are Qingxin Oolong from Shan Lin Xi, of course. But they are medium roasted, Hung Shui style and were harvested on April 26, 2014. 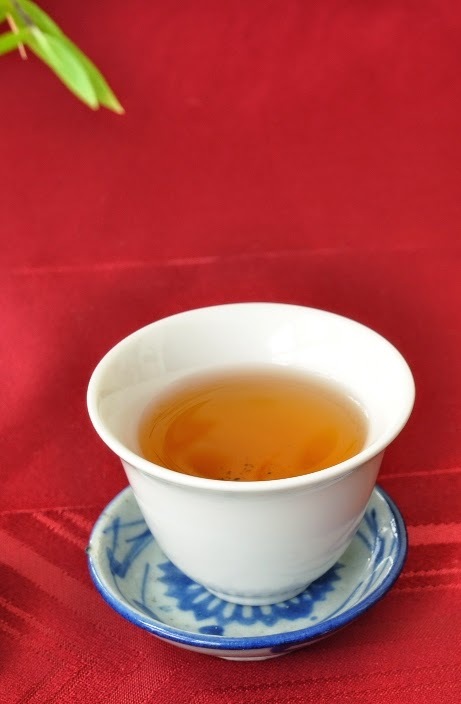 There are few stems, because they were originally intended for the Dong Ding tea competition. A sweet, light and dark roasting scent comes from these dry leaves. This nice smell is also present in the brew. It starts with the sweet and nutty roasting flavors and fades into lighter and fresher notes. 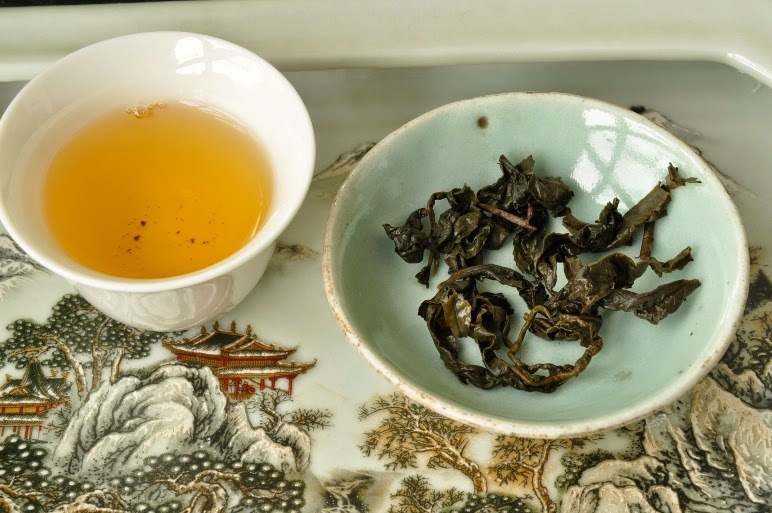 The complexity of a roasted high mountain Oolong has been well preserved. 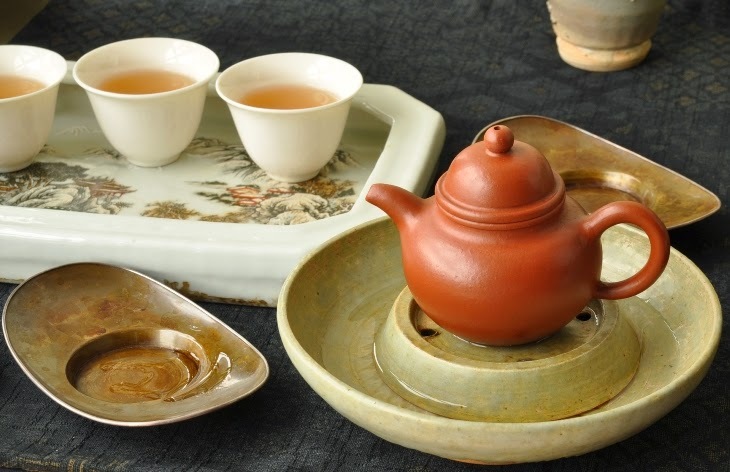 It can be brewed with porcelain gaiwan, or with an Yixing hungni teapot. In both cases, it's important to well pre-heat the vessel before the first brew. 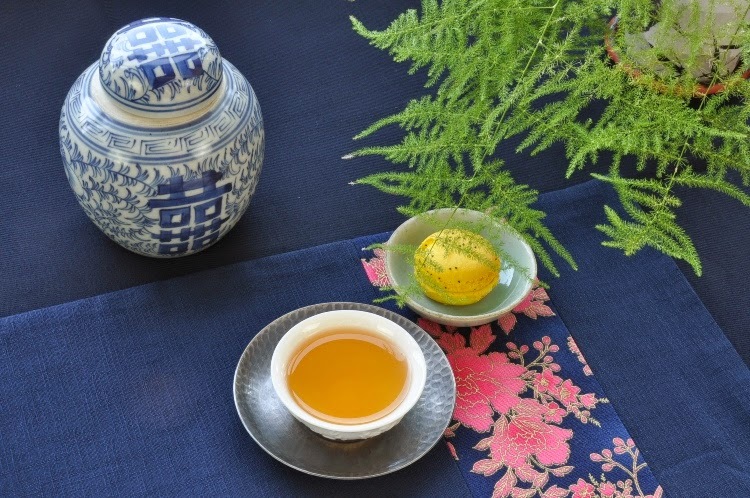 Spring 2014 Oolong is still young and tightly rolled: it requires energy (high temperature) and time to unfold well. 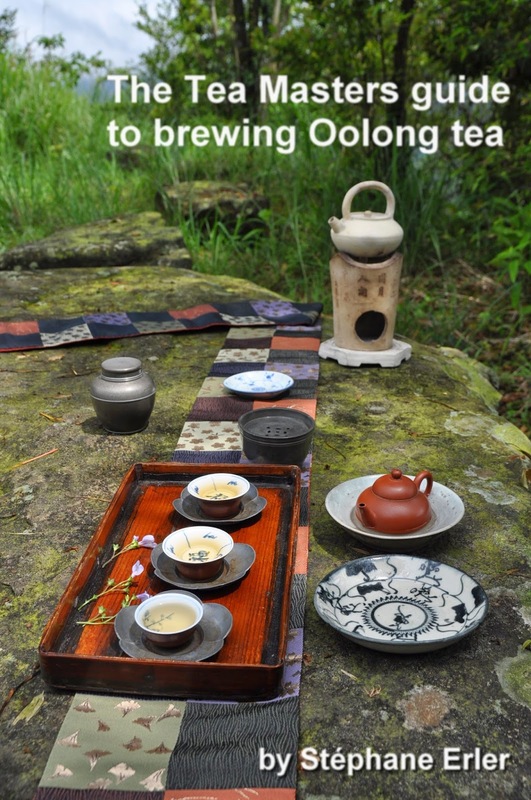 Hungshui Oolong is always more difficult to brew than one-dimensional Oolongs (without any roasting). It's more important to pay attention to balance the flavors and to respect the character of the leaves. 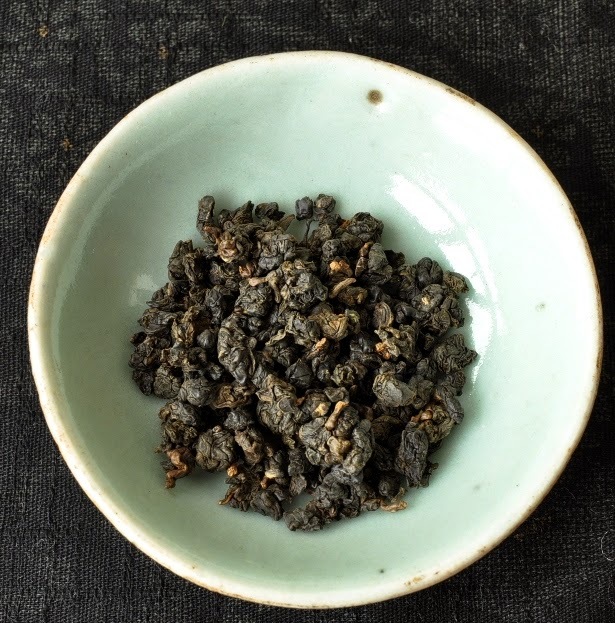 This is a good, affordable Hung Shui Oolong to practice your brewing technique. It all starts with realizing that each brew is different from the previous one. 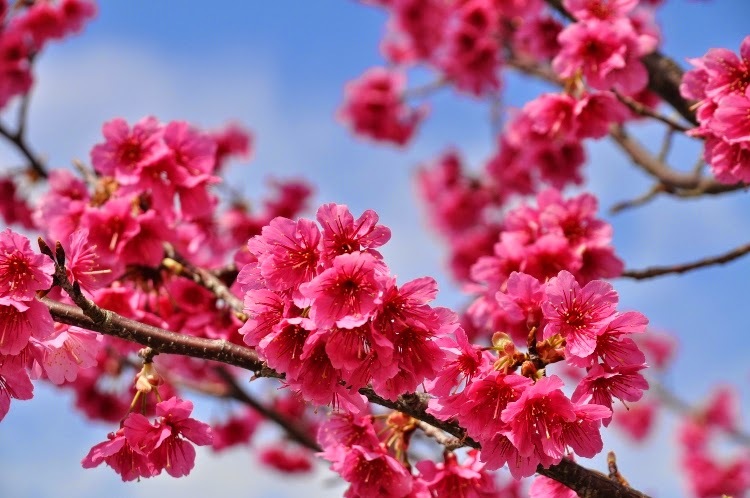 The more you are sensitive to these changes, the more you'll be able to learn with experience. These leaves do unfold completely after several brews. This is a sign that the roasting process wasn't done too hot and didn't turn the leaves into charcoal. 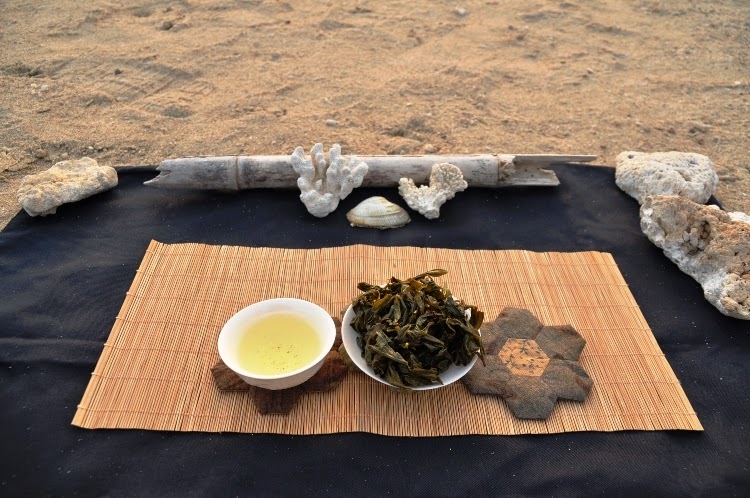 High mountain Oolong isn't always just green and fresh. When it's nicely roasted, it will develop a dark side that is just as bright and beautiful!